Find out what your child will be taught in Year 6 English and support their learning at home so they feel confident in their skills, ready for the move to secondary school. Children should be allowed to choose a book at school to take home with them to read and will still be reading with their teacher in groups once a week (this is called guided reading). Year 6 children are usually confident writers, able to express their ideas imaginatively and clearly, whether they are working on fiction, non-fiction or poetry. If your school has a newspaper or magazine, encourage your child to take part – they could write about a hobby or school club. Help your child practise what they're learning in school with our year 6 English worksheets, or browse through our selection of KS2 SATs papers to help them prepare for the SATs exams at the end of year 6. You can also follow our KS2 SATs Learning Journey. 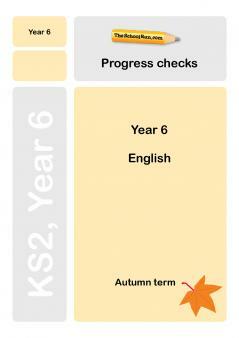 Check your Y6 child's progress in English with our free Y6 English Progress checks, three mini-tests for the autumn, spring and summer terms.